37 Facts You Definitely Didn't Know About "Mario Kart"
For the last 22 years, the Mario Kart games have made us laugh, they've made us cry, and they've made us break our N64 controllers in RAGE, because I WAS THIS CLOSE to winning if YOU HADN'T THROWN THAT BLUE SHELL AT ME. YOU RUINED MY SLUMBER PARTY, BRIAN! 1. The antigravity mechanic in Mario Kart 8 began as a drill that players could equip to tunnel under each of the tracks. 2. Wario actually gets his name from a portmanteau of "Mario" and the Japanese word "warui," which means bad. His name essentially translates to "Bad Mario." 3. The same goes from Waluigi. In fact, his portmanteau works even better in Japan, where his name is pronounced "Waruigi." 4. Whomps are inspired by the Nurikabe of Japanese Mythology. Nurikabe were said to take on the form of walls to hold up travelers. 5. Thwomp's laughter in Mario Kart 64 is actually Wario's laugh slowed down. 6. Mario was considered as a playable character in Sega's Mario Kart-inspired racing game, Sonic & All-Stars Racing Transformed. 7. In the Japanese version of Super Mario Kart, both Bowser and Peach were shown drinking champagne when they won an event. The animation was changed for the North American release. 8. The tunnel shortcut that can be found in "Kalimari Desert" actually takes longer than using the normal race route. 9. The Japanese version of "Moo Moo Track" is called "Moh Moh Track," because in Japan, cows are thought to make more of a "moh" sound than a "moo" sound. 10. The fake ads seen in Mario 64 resembled logos from actual companies in the Japanese release. They were changed for the North American release to avoid legal problems. 11. In its early development, Mario Kart 64 was titled Super Mario Kart R.
12. In Mario Kart 64, if you let the music on the results screen loop 64 times, the music will change to an alternate tune. 13. The Magikoopa known as Kamek was going to be a playable character in Mario Kart 64. 14. An icon for the Chain Chomp item from Mario Kart: Double Dash can be found in the code for Mario Kart Wii, but was replaced by the Bullet Bill item. 15. Several unplayable tracks from Mario Kart 64 can be found in files for Mario Kart DS and Mario Kart Wii. It's thought the tracks were used for testing. 16. There are several unused images included in the data for Mario Kart Arcade GP, including a picture from the 2004 Beslan school hostage crisis, for some strange reason. 17. 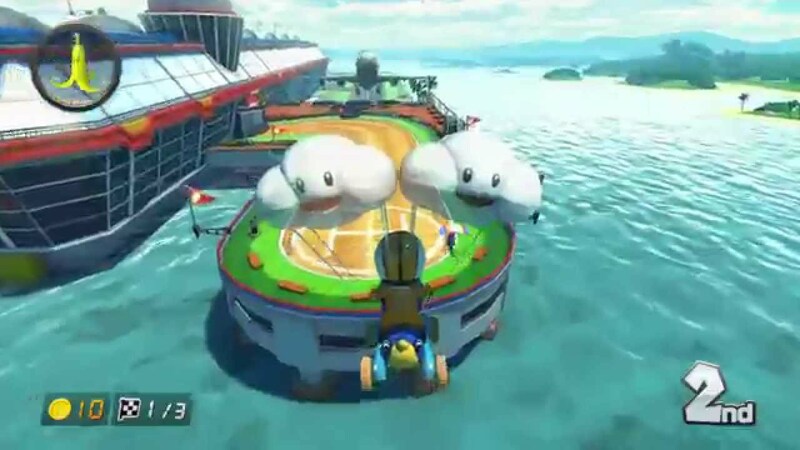 In Mario Kart: Double Dash you can see buildings from Mushroom City under Rainbow Road, suggesting that the stages take place in the same area, and that the latter is floating above the former. 18. The handbook for Super Mario Kart actually encourages players to look at their opponents' screens, which most gamers consider a form of cheating these days. 19. In 2013, a 10-year-old boy took control of his great-grandmother's car after she had a heart attack while driving. He claims he learned to drive from playing Mario Kart Wii. 20. Mario Kart 8 is the first game in the franchise to feature a fully animated mustache on Mario. 21. The creators of Mario Kart 64 came up with the idea of the blue shell after processing limitations prevented them from showing all the characters on screen at the same time. The blue shell was their solution for quickly clearing an overcrowded track. 22. You can actually buy a working, full-size kart from the Mario Kart franchise. 23. A news story from the November 1992 issue of Daily Yomiuri claimed that Luigi was actually evil: "The most recent game, Mariokart, features races between Mario and his evil brother, "Luigi," on a total of 24 Formula 1-style racing circuits." 24. If you listen closely while driving through the cave sections of "Shy Guy Falls" in Mario Kart 8, you can hear the Shy Guy miners singing along to the level's music. 25. There's a reference to those same Shy Guy miners in the level "Toad Harbor" where you can see a sign for "Shy Guy Metals." 26. Mario Kart Arcade GP 2 was the first game to feature the series regular Waluigi. 27. If you look closely, you can make out what appears to be "Koopa Troopa Beach" from previous Mario Kart games in the distance during "Sunshine Airport" in Mario Kart 8. 28. When Mario Kart 64 was released for the Wii Virtual Console, the lightning power-up was changed to show a less intense flash. This was likely done to prevent seizures. 29. The large piranha plant in the center of the quicksand pit in the Mario Kart: Double Dash!! version of "Dry Dry Desert" is likely a reference to the Sarlacc pit from Star Wars Episode VI: Return of the Jedi. 30. Pac-Man, Ms. Pac-Man, and Blinky the ghost were all playable characters in the oft-forgotten Mario Kart Arcade GP, which could only be found in arcades. 31. Mario Kart Arcade GP is also the only Mario Kart game to be developed by a third-party company. It was made by Namco-Bandai, which is why it features Pac-Man characters. 32. In addition to the return of the character from the Pac-Man franchise, Mario Kart Arcade GP 2 also featured a racer named Mametchi, from Tamagotchi digital pet toys. 33. Mario Kart Arcade DP DX, the third arcade installment in the Mario Kart series, features playable drum characters from Taiko: Drum Master. 34. Petey Piranha, the Paratrooper, and a Hammer Brother were all planned to be playable characters in Mario Kart Wii. 35. Mario Kart DS featured the failed Nintendo robot peripheral R.O.B. as an unlockable character. 36. An unused pink egg kart in the data of Mario Kart DS might suggest that Birdo from Super Mario Bros. 2 was in consideration as a playable character. 37. While playing the course "Dry Dry Ruins" in Mario Kart Wii as a Mii, the sphinx will feature the face of the Mii you're playing as.